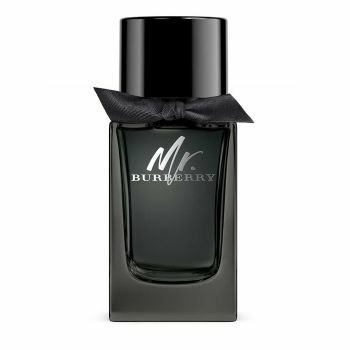 Introducing Mr. Burberry Eau de Parfum. An intense interpretation of the original Mr. Burberry, the fragrance captures the essence and anticipation of London at nighttime. A warm, sensual and woody scent with fresh and aromatic top notes of tarragon and comforting, spicy cinnamon, layered delicately on rich patchouli with a base of amber and smokey vetiver. The bottle honours the black Heritage Trench Coat and its signature design details. Bold and masculine, the weighted cap references horn-look buttons, while a hand-tied knot in English-woven gabardine sits around the neck, celebrating the innovative fabric invented by Thomas Burberry more than 100 years ago. The dark lacquer bottle conveys the sensuality and warmth of the scent and the accompanying campaign.